The 2018 Toyota Highlander is an appealing vehicle because it has a versatile cabin and a host of customizable options. There are, of course, other aspects, such as engine performance and safety features, that play a role in determining which car is best for you. 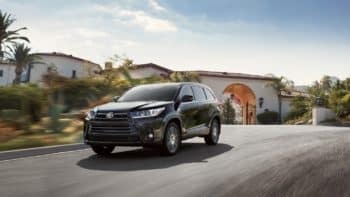 This Toyota Highlander review will detail a range of important features to help everyone near Avon, Indianapolis, and Plainfield understand the unique benefits of this model. And, if you have any questions or you want to get behind the wheel of the Highlander, just contact our team at Andy Mohr Toyota today. The Toyota Highlander has a range of distinct engine options. Each offers enough power to haul the whole family, yet subtle differences give each engine a unique quality. The first engine, at 2.7-liter 4-cylinder, comes with a 6-speed automatic transmission and gets an EPA-estimated 20 city/24 highway MPG.¹ It produces 185 horsepower and 184 lb-ft of torque. The second engine, a 3.5-liter V6, has an 8-speed automatic transmission and gets an EPA-estimated 21 city/27 highway.¹ It produces 295 horsepower and 263 lb-ft of torque. Finally, a hybrid option is also available. This 3.5-liter V6 engine utilizes an electronically controlled variable transmission and gets an EPA-estimated 30 city/28 highway MPG.¹ It produces 306 net horsepower. Whether it’s entertainment or cargo and seating space, the Highlander gives you options to better suit your needs. First, you have the availability to seat either eight passengers or, if you want to remove a seat or fold it down, you can seat seven passengers while creating more cargo space. Overall, you’ll have an available 83.7 ft3 of cargo room behind the front row, 42.3 ft3 in the second row, and 13.8 ft3 in the third row. For entertainment and convenience, there’s the available Entune™ Premium JBL® Audio with Integrated Navigation. Along with being able to access your favorite music on an 8-inch touchscreen display, you benefit from up-to-date directions courtesy of the navigation system. If you prefer to listen to the radio, you can take advantage of the available SiriusXM® Satellite Radio with a 3-month complimentary SiriusXM® All Access trial. Finally, to keep the kids entertained on long road trips, available rear-seat Blu-ray Disc™ entertainment systems come with high resolution 9-inch displays and two wireless headphones. 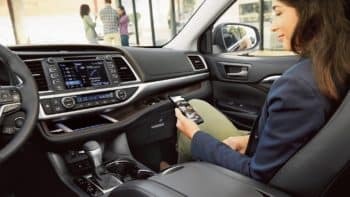 Find out more that the 2018 Toyota Highlander interior offers. Always keeping an eye on safety, the 2018 Toyota Highlander will help to protect you and your passengers. First, an available Rear Parking Assist Sonar will alert you if you’re about to bump into another vehicle or any other object while you’re trying to park or pull out. And the available Blind Spot Monitor and optional Rear Cross-Traffic Alert both make driving much easier and safer. With the Blind Spot Monitor, you’ll be alerted to vehicles driving in your blind spot if you attempt to change lanes. And, with Rear Cross-Traffic Alert, you’ll be warned of incoming traffic if you’re trying to reverse out of a tight parking spot. With the ability to make customizations depending on your lifestyle and the dedication to safety, the 2018 Toyota Highlander is an appealing option for families near Avon, Indianapolis, and Plainfield. To be sure, though, you’ll probably want to get behind the wheel and experience all these exciting features for yourself. All you have to do is contact Andy Mohr Toyota and we’ll help you schedule your test drive today.